Yeah, it’s another article about LeBron James. You know, the guy holding NBA free agency and your Twitter feed hostage right now. The guy who kind-of-but-not-really-but-probably is the reason why Dwyane Wade opted out of $40 Million in guaranteed money over the next two years to free-up cap space so the Miami Heat could be a more attractive destination for other free agents. The guy who is dominating ESPN and sports radio, even though the NBA season won’t start for another four months. But hold on, I’m not here to speculate about which team he’s signing with, where Dan Gilbert’s private jet may or may not have been, or about what the hex codes on LeBron’s website mean. I’m focused on the fact that, as a 6’8’’ 260-pound point guard in a power forward’s body who is currently the best player in the world, LeBron has a staggering amount of options in front of him; a situation that some of us might be familiar with, in a different context of course. Does LeBron return to Cleveland to essentially right the wrong of “The Decision” and bring his hometown the title it’s been craving for 50 years? 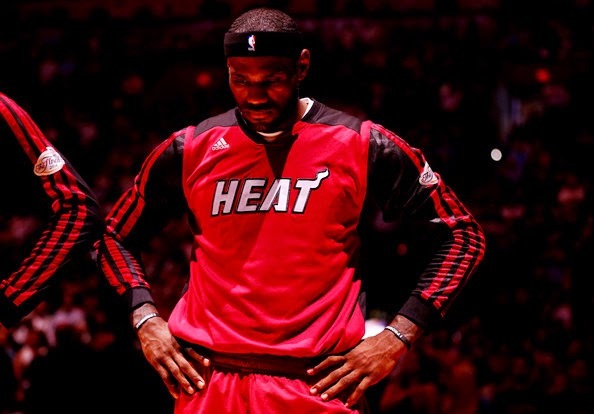 Does he go back to South Beach, answer Pat Riley’s challenge, and finish what he started with the Heat? Although it seems pretty clear at this point that he’s deciding between Miami and Cleveland, LeBron could easily sign with Los Angeles, New York, Houston, or any number of attractive destinations (attractive is a term I use loosely based on the current Knicks and Lakers rosters). With the next few years of his career on the line, which coincidentally happen to be the last few years we can reasonably expect LeBron to remain in his prime (he turns 30 in December), there’s good reason he’s taking his time to figure things out. Of course, when you have the ability to turn whichever team you chose into an instant title contender, you know you can attract other stars to play alongside of you, and you’re fielding offers to play basketball for more money than you could reasonably spend in a lifetime, all of these options start to blend together a little, don’t they? We’ve never seen a player command this kind of attention off the court (LeBron’s summer of 2010 excluded), and similarly, we’ve never seen a player quite like LeBron on the court. If you think he has options during the offseason, consider a player who can do nearly whatever he wants on a basketball court; that’s LeBron James. Too powerful for guards, too quick for bigger players, and blessed with the ability to create his own shot as easily as he can create shots for his teammates, there’s a nearly endless collection of ways LeBron can beat opposing teams. With all that being said, maybe we shouldn’t be so confused when we see LeBron defer to teammates with the game on the line because his skills have always afforded him so many options that it’s generally more a matter of making the right decision than having that decision lead to the right outcome. In a more general sense, we’re taught growing up that having options is a good thing. Being able to choose where you attend college, being able to choose a job you find fulfilling, being able to choose every excruciating detail about your new cabinets, and having various options when making a number of other critical life decisions is certainly a blessing and something no one should take for granted. But at a certain point, having too many options can become overwhelming and lead to complications. At a certain point, the difference between Option A and Option B is so miniscule that the more we think about things, the less we’re sure of our decision. In some ways, the staggering number of choices LeBron has at his disposal on and off the court mirrors our lives today. When we’re growing up, we are infused with the message that we can do whatever we put our minds to. We are surrounded by more sources of entertainment and more media outlets vying for our attention than previous generations ever could have conceived of. At the same time, technology continues to advance and new career paths and opportunities are being created that didn’t exist just a few years ago. The options we have to decide how we make a living and how we spend our time on this earth are expanding every single day. And with all of the benefits these advances afford us, they can also be counterproductive if not processed properly. If you’re fortunate enough to grow up with parents who love you, who can provide for you, and who value your education, you know you can chose any number of paths to find success. But at some point, you have to filter out all of the choices, all of the noise, and make a decision. Whether it's where you're playing basketball next season, passing to an open teammate or taking the game winning shot yourself, or where you're going to college, having too many options to choose from is better than the alternative, but too much of a good thing can be bad in its own right. LeBron’s critics will point to the fact that he lacks a killer instinct; comments that no doubt stem from watching him fail when it would appear he has everything necessary to succeed. Similarly, it can be frustrating to watch someone you know, who has immense talent, fail to realize their potential. But rather than attributing the few shortcomings that may be present in LeBron’s game solely to something he lacks or, more generally, attributing someone’s inability to make good on their talent solely to something they lack, perhaps it’s due to the fact that they have to too much.